General information: Nicely done out bar on multiple levels. Happy hour 5pm - 7pm every day. Now refurbished and called Gem but every bit as awful - certainly not a gem! Rude, slow service - twice had to question if the barmaid always served her friends before people who had been waiting ages and was then served promptly. Badly made cocktails in the wrong glasses. Went there for a Christmas party and it was just awful. I was there no more than 15 mins when a mass brawl broke out with around 10 to 12 pissed idiots and the door staff did nothing. 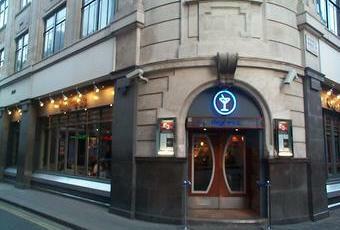 Infact the door staff were far to busy outside telling people where to stand and just being generally rude to people. The place was that packed that you couldn't stand comfortably and the fact that the dj thought it was a good idea to play Justin Timberlake at full blast all night just added to a truly unpleasant evening. The staff behind the bar were rude and the majority of the customers were just as unpleasant as the staff. Avoid this place at all costs. It's the kind of place that gives Soho and London in general a bad name. I was there last night, HELL!!!! Full of drunk idiots and bar staff dont listen what you asking for.I asked for 4 sgl vodka and received 4 double in VERY double price. Toilet smelly and not clean.Avoid this palce. Not recomended. Dont leave you drink unattended cos floor staff will take even if is full.Happen to me twice. I popped in here on Friday afternoon to find that it hadn�t changed since my last visit around 8 years ago, when an exceptionally ignorant bouncer barred me for pointing out that his head was the biggest bucket of meat I had ever seen. It looked fairly empty at 5 on Friday, but upon entering I noticed that 60% of the tables were reserved for party groups. I ended up standing outside where I noticed that they have put a couple of tables and a few chairs under a canopy. I had to wait for a couple of minutes to be served as the barmaid was rushed off her feet and the 2 managers/supervisors behind the bar were far too busy managing/supervising to serve anyone. When my coughing was heard and I asked for a pint I was served the wrong one � well done! I didn�t really like it in here when I was in my early 20�s, so it doesn�t stand a chance now!